Pictured here is a panoramic view of the area behind Red Top's park office. This area is used for many different purposes from Iron Pour's to historic demonstrations. 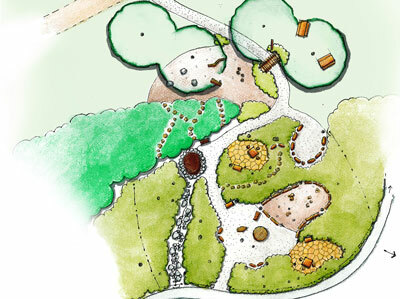 Beginning in the fall of 2015, it will also be the site for a new Outdoor Classroom brought to you by the Friends of Red Top Mountain in partnership with Keep Georgia Beautiful and the local affiliate, Keep Bartow Beautiful. The classroom was designed by NatureExplore, the nation's leading designer of outdoor classroom spaces, and will occupy a currently unused space at Red Top with views of the lake and easy access for park visitors. Fundraising for the classroom has begun and Friends of Red Top is actively seeking donors and partners to help the classroom become a reality. Thanks in part to a generous donation and partnership with the Georgia Ultrarunning & Trailrunning Society, Friends of Red Top has already raised about $20,000 for this effort. If you'd like to get involved, consider making a tax-deductible donation today. Red Top Mountain State Park in Acworth, Georgia brings a unique blend of cultural and natural resources to your outdoor experience. As a wealth of educational and recreational opportunity, Red Top Mountain has become a favorite among many. As its popularity grows, so does the park’s potential for opportunity and expansion. It’s because of these opportunities and increasing potential that Friends has chosen this park as one of the first to receive an outdoor classroom. Outdoor classrooms are focal points for free play with integral elements of education and recreation. By creating safe areas that welcome this free play, Friends believes that we’ll be able foster dynamic nature-based play opportunities for children and their families, which will cultivate healthy communities. Red Top’s outdoor classroom will be divided into distinct activity areas and provide a complete mix of activities meeting a multitude of needs and learning styles. By keeping areas separated based on activity, behavioral issues are reduced and children are free to take materials from area to area and combine materials in interesting ways. A few of these activity areas include a climbing area, a gathering area, an open area, messy materials area, building area, digging area, a music and movement area, and others. By converting raw materials into discovery tools, a new world of opportunity is opened. Creativity is unleashed and children’s learning is expanded. Tree stumps become a climbing area, hollow logs become tunnels and branches are converted into forts! There is no limit to the fun and creative opportunities experienced in an outdoor classroom. Through the support of generous donors, community volunteers, and corporate partners, Friends will be able to transform these plans into a reality. We are quite anxious to be able to share this excitement with you! Please contact Friends if you are interested in helping make a difference.